Just a few days away from leave, Sgt. 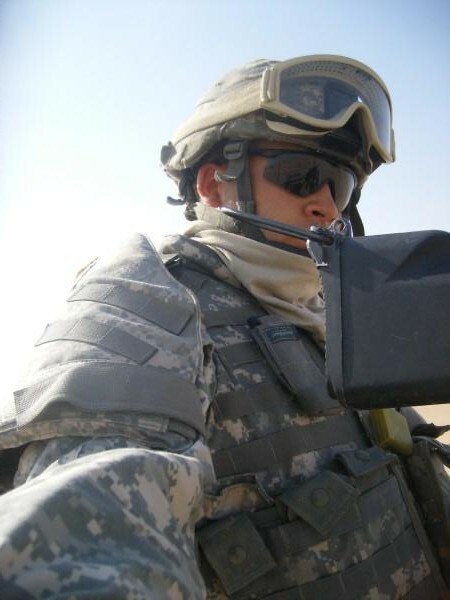 Joel Tavera volunteered to take another soldier's duty shift. He soon learned that his life was about to take an abrupt turn. On March 12, 2008, inside the Tallil air base in southeastern Iraq, Sgt. Tavera's armored SUV was hit by an enemy missile, killing three soldiers. Joel was one of two who survived the blast, but we was burned, blinded and bleeding. "The last thing I saw was a flash of blue sky, and that was it," recalls Joel. The force from the rockets and explosives also fractured Joel’s skull, and he spent the next three months in a coma. When he finally came to, the pain from his burns, which cover 60% of his body, was so intense that he needed heavy medication for nearly a year. He gained a Purple Heart and Bronze Star, but lost sight in both his eyes. He also lost four fingers, and his right leg below the knee; but he didn’t lose his will to live; far from it. For the past two years, Joel has spent his time relearning the basics. He said many people thought he would never walk again, and for the majority of time since the accident, he was confined to a wheelchair. Amazingly though, this hardworking young man has beaten all the odds, and not only walks, but recently finished a 5k walk in an hour and 13 minutes! What’s the rush? Joel has a surgery coming up that will replace a piece of his skull, and will likely keep him from doing much of anything, let alone walking three miles. So, he’s taking in as much life as he can, before he has to cut back. When asked if he ever gets angry, Joel admits that he does, but says it’s not the way he chooses to live his life. So, that’s exactly what he does. Still active duty, Joel’s new job is not only to get better, but to give back to others. He says his injuries have opened up a whole new world to him and he wants to share his story in the hopes of inspiring other people to keep trying. The only thing that keeps this motivated soldier down is pain. That’s where HHN comes in. Joel receives weekly Acupuncture on his amputated leg from HHN provider William Lichter, DC; something that makes a huge difference in his life. With the help and support of talented providers like Dr. Lichter, we at HHN are happy that we can provide this true American Hero with a little relief. Especially when people said he should be satisfied with the miracle of survival, and that he would never walk again or function on his own. To their surprise, he did just that, and continues to have hope for his future. “I want to get married and have a family and live on my own,” said Joel. Read the entire newsletter and see what HHN has been up to and the Heroes we're helping! Today is the day to let TIME know how much America values the Military Family by asking the magazine to name the Military Family it's 2011 TIME Person of the Year. LIFT has penned a letter (pasted below). Tsetsei's goal is to "overwhelm TIME Magazine with letters from across the country. The letters will introduce the editors to the idea, and with luck, they’ll get so many of them it will attract media attention". Please take a moment today. Print the letter below, sign it, and send it to TIME. I’m writing this letter to ask you to consider the military family as your 2011 TIME Person of the Year. If you accept nominations from the public/your readers, please consider this an official nomination. Military families will be the first to say they don’t want to be honored or praised, but I understand Person of the Year isn’t an honor; it’s a “recognition of somebody’s effect on the world,” as Richard Stengel has said. Evidence of the military family’s impact on recent news and popular culture can be found in the efforts of Michelle Obama and Dr. Jill Biden to raise awareness of the military family, in Oprah Winfrey’s multiple shows honoring the military family, in the upcoming fifth season of Lifetime network’s “Army Wives,” and in the E! Entertainment channel special, “E!Investigates: Military Wives.” Any time the wars in the Middle East are in the news, so is the American military family. Regarding the military family’s effect on the world, Rudy Giuliani was chosen for Person of the Year following the September 11 attacks because he “embodied what was really most important, what we learned about ourselves, which was that we could recover,” explained a TIME editor. The military family embodies what is most important after a decade of war and multiple deployments: a resilient and unifying force even as the families grow weary of being separated - sometimes permanently - year and year, those years apart filled with agonizing anxiety and uncertainty about the future of their families. That resiliency speaks volumes about who we are. According to a February 2009 study conducted by Boston University’s Sloan Work and Family Research Network, “43.2% of active duty forces have one or more children.” Without a military family care plan—siblings, grandparents, spouses, or others to care for those children—nearly half of our deployed forces would be rendered useless. The challenges the families of service members experience don’t include the direct threat of mortar rounds and IEDs, but they do include the 24-hour awareness that mortar rounds or IEDs could kill the person they love – their parent, their child, their best friend – any minute of any day, as well as the unique task of trying to maintain a sense of normalcy for children who have a revolving parent and a home environment that is in a perpetual state of flux. I hope you’ll give this nomination the serious consideration it warrants.